Post by Inside Zhan Zhuang. New Excerpt From "Zhan Zhuang Wisdom - The Breath Of Life"
Aloha from Maui. Here's the new excerpt from "Zhan Zhuang Wisdom - The Breath of Life." Once this has occurred we have begun to become in touch with the energetic aspects of the training. And these will come into play even more as we explore Longevity Breathing and enter into states where the breath takes unusual forms and sometimes seems to disappear altogether. To perform the Longevity method correctly, it is important to first define a few important parameters. Try this; inhale and then exhale normally. On the exhale note the place where the abdomen is most fully withdrawn. (Moved back toward the spine.) Now gently hold the abdominal muscles in, to that same moderate degree. This is done using only the minimal amount of force necessary and applied mostly to the following four points or corners. The first two points lay on the line of the navel where the Rectus Abdominis muscles meet the External Obliques. In other words the Left and Right Dan Tiens. The second set of points each lie on a line directly below the Left and Right Dan Tiens respectively, where each line intersects its respective inguinal crease. Now having located the four masterpoints and while keeping them slightly withdrawn, [held in] breathe in very gently, slenderly and slowly behind the abdominal muscles such that the breath reaches the Perennial region and begins to fill the low back and Sacrum first and then an instant later, the sides and front. Once the breath has filled out the ‘circle’ in all directions at the level of the Perineum/Sacrum/Low Back, as you continue to inhale, the breath will seem to rise, like filling a large energetic cylinder which physically becomes the entire torso [abdomen and chest] and then later, the neck and head as well. The organ massage spoken of earlier starts to occur as we drop our breath to the bottom of the torso. As we feel the breath reaching the floor of the urogenital diaphragm (Perennial Region) we soon realize that our (Hiatal) Diaphragm located at the at the level of the lowest rib has descended toward the pelvic floor in the process. And if done right, this will also include the chest and particularly the Sternum. This descending motion creates a slight compression within each of the internal organs which is in turn, released and becomes expansion as we begin inhaling. Please note that this method is in direct contrast to the forceful withdrawal and tightening of the abdomen used in ‘Packing Breathing’ which people train in order to develop the Iron Body and Golden Bell Cover protection mechanisms. Lastly, as one continues to practice the Longevity method they will find their breath elongating further and further, until the difference between inhale and exhale seems, if only temporarily, to vanish. This leads for some to the idea of breathing or needing to breathe itself temporarily disappearing. And with that we come full circle and arrive once again at the Natural Breath, only now with and entirely new understanding. This form of Natural Breath has been found to also have a number of other health rejuvenating benefits, not the least of which, is the increased oxygenation of the blood and increased tissue oxygen saturation. Increased blood oxygenation leads to improved circulation which nurtures the entire organism, including the brain. The increased oxygenation is especially valuable to the brain where it helps stave off the untimely cessation of brain cells which would ordinarily lead to problems like Alzheimer's, dementia and the like, as we grow older. Increased tissue oxygen saturation helps such things as the muscles to function longer and more optimally during prolonged exertion. This can be very useful in maintaining one’s vitality into old age. As well as our daily Zhan Zhuang and Taijiquan training. 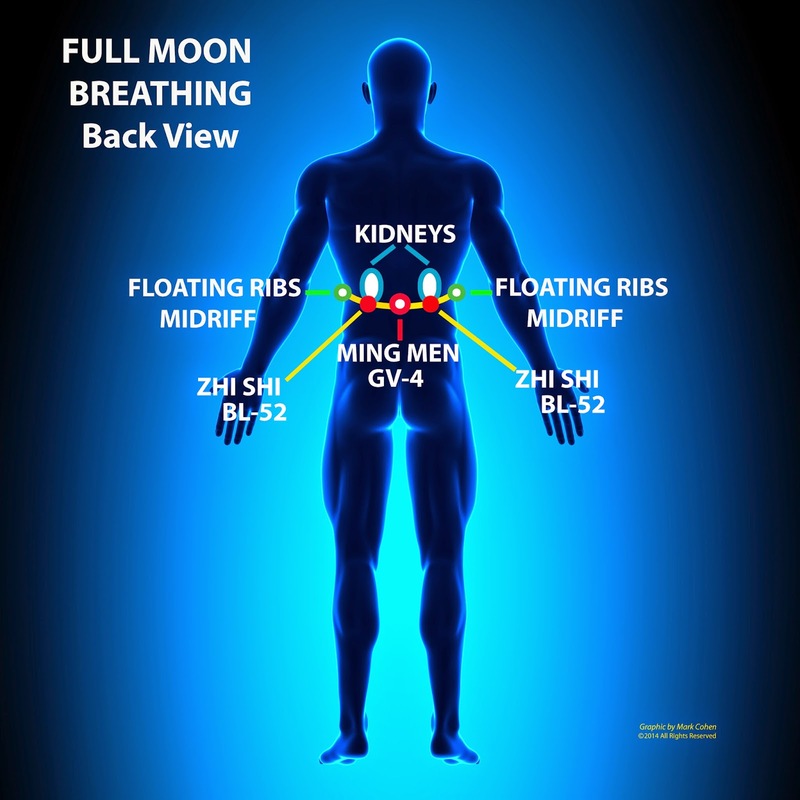 New Excerpt from "Zhan Zhuang Breathing Methods - The Breath of Life"
The Full Moon breathing method adds three additional points on the back to the five Half-Moon points already mentioned. These are Mingmen, GV-4 and two points roughly equidistant between Mingmen and the two Jingmen points. These are located in the vicinity of Zhishi point BL-52, on either side. In combination, these eight points create a complete circle, and when the inhale is generated from the body’s centerpoint, they form the basis of Spherical Breathing. 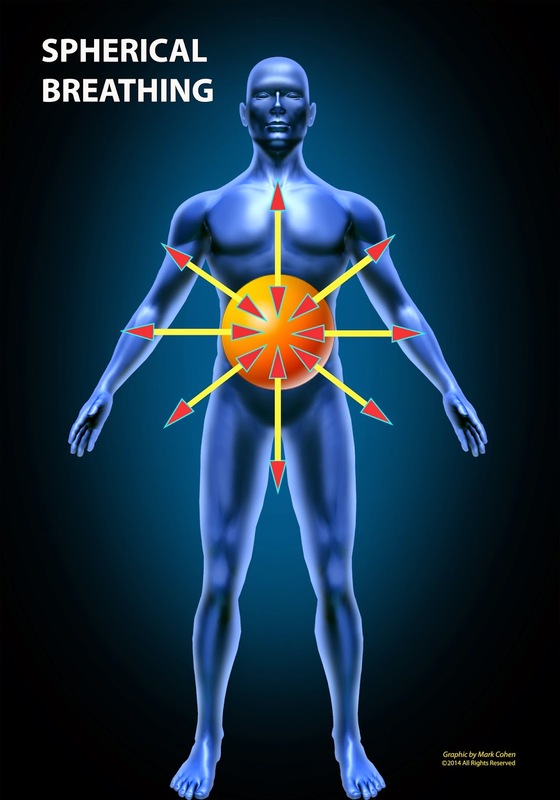 That is, an equal expansion in all eight directions from the tiny sphere of our centerpoint to an energetic sphere that eventually encompasses the entire torso and later the whole body, including the extremities. 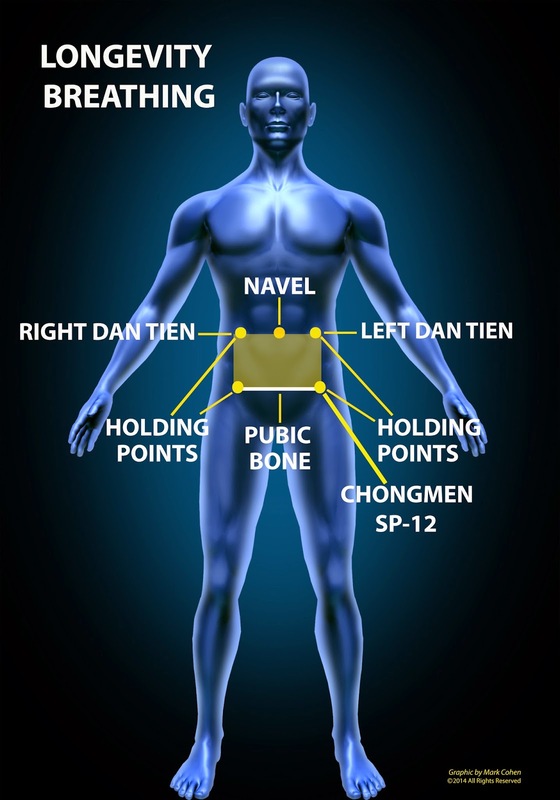 As this technique becomes comfortable, the practitioner finds that the vertical elements also come into play, that is, from our centerpoint downward through Huiyin point, CV-1 in the perineal region and also upward to Baihui point GV-20. When we exercise the Half-Moon method, often we can see and feel a lot of movement in the tissue, even on the sides. But when we add the points on the back something unusual happens. All of a sudden the amount of abdominal movement we had earlier appears to become greatly reduced. This results from the stretching or expanding of the tissue of the back which takes away from the elasticity in front. But as we become more comfortable with the equilateral expansion in all directions, this feeling will change. With enough experience, one begins to feel a sense of unified, equal expansion without resistance. At that point we are ready to add one final element which will lead us into what some have called Longevity Breathing. But before we do, a brief recap is in order. The navel - which expands forward, and the Mingmen - which expands backward, together create the archetype for the depth [front to back] dimension. The two Jingmen points, each expanding laterally generate the archetype for the horizontal aspect or width. And finally Huiyin and Baihui points, activated from our centerpoint induce the vertical dimension or height aspect. With enough daily practice all three dimensions will find their correct dynamic tension, at which time the breath seems to expand and condense without a sense of impediment from the muscles or other tissues.